Some 13 years since Sidney Shaievitz formed a society to keep alive the memory of the Jews murdered in the 1919 pogrom in the Ukrainian shtetl of Felshtin, and one year after he took part in unveiling a memorial there, the Livingston lawyer says he is almost ready to make their story available in English. “Almost” is the key word. A 670-page memorial book, written in Yiddish by Felshtin survivors, was published in 1937 in New York. Shaievitz, whose mother was a Felshtin survivor, has been working since the late 1990s on producing a definitive English translation. A few dozen copies of an early translation were issued, and there is a disk of a later improved version, but this, he told NJ Jewish News, will be the definitive edition. 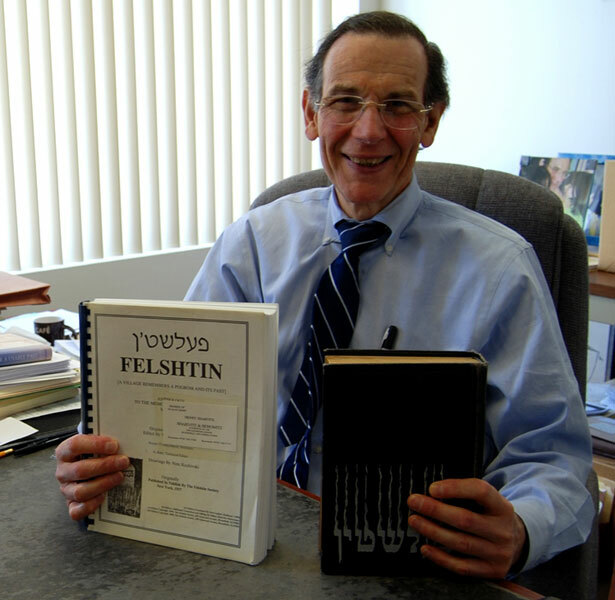 The Felshtin yahrtzeit book was one of the first and most complete of its kind. It tells of ordinary life in a fairly typical Eastern European village, and the atrocities that followed in February 1919. Immigrants, mostly in New York, recalled how they and their loved ones were savagely attacked by marauding Ukrainian soldiers. It provides a partial listing of the 600 men, women, and children who died. While the Holocaust continues to be memorialized, “and rightly so,” Shaievitz said, the prewar pogroms that took thousands of Jewish lives “have become a footnote to Jewish history.” Life in the shtetls “has been ‘Hollywoodized,’” he said, the reality supplanted by images from Fiddler on the Roof. He feels that the Felshtin yahrtzeit book not only provides a family memoir for the victims’ descendants but also offers the wider public a window onto that lost world. Shaievitz knew a bit about what his mother had endured as a child, but hadn’t given it much attention. Only after she passed away and he discovered that he didn’t even know her father’s name did he realize how little she’d ever spoken about her past. He found his grandfather’s name — Shlomo Mekhel Huberman — in her copy of the old Felshtin book; he was number 84 on the list of fatalities. Drawing on his very basic knowledge of Yiddish, Shaievitz began trying to read the book, but made little headway. 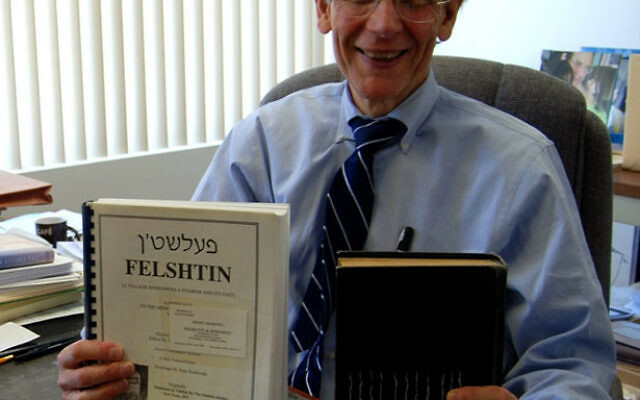 Using the Internet, he tracked down other Felshtin descendants, and in 1998 formed the Felshtin Society. With donations from its members, he commissioned that first English translation. But as his own knowledge of Yiddish grew, Shaievitz began to spot errors in the work. He puzzled over discrepancies, and sought expert advice — only to find one question leading to another. “I wasn’t a Yiddish translator, but I’ve become one,” he acknowledged. An engineer before becoming a lawyer, he admits to being a perfectionist. Among the law books and files in his Bloomfield office there are piles of dictionaries — Yiddish, Hebrew, and English — and stacks of folders containing his correspondence with linguists and historians all over the world. The yahrtzeit book’s contributors wrote the way they spoke, and pronunciations varied, as did the idiomatic use of words. Other words proved so obscure, even academics from Moscow argued over the meanings. Becoming more and more familiar with what happened to the 1,900-strong Jewish community in Felshtin — through the pogroms and then in the Holocaust — “has devastated me emotionally,” Shaievitz said. Talking about the brutality, his eyes filled with tears. Last year, on a trip led by society president Dr. Melvyn Werbach, Shaievitz visited Felshtin, now known as Havardiyske, with his daughter Sondra and three other Felshtin descendents. On May 18, 2010, at a ceremony presided over by the Chabad Lubavitch rabbi from the nearby community of Khmelnitskiy (formerly Proskurov), they unveiled the memorial to their massacred relatives. They were joined, to their great satisfaction, by a crowd of people from the community. They found the site decorated with flower beds and a menora. Later, they were treated to a concert by local school children. Shaievitz said it was in keeping with the spirit of the place; the Jews in Felshtin had lived in harmony with their gentile neighbors, and when the attackers came, some were saved by them. “The visit was an extremely moving experience for everybody,” he said.